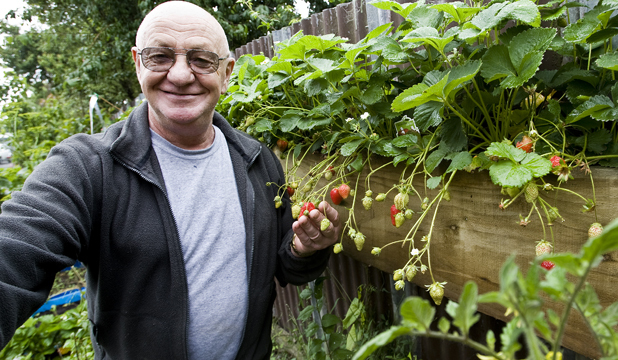 Manawatu gardening guru Wally Richards grows his strawberries in wooden troughs attached to his fence. In a shed smelling vaguely of coffee grounds, LEE MATTHEWS talks to Manawatu's best-known gardener, Wally Richards, about slaughtering white butterflies, happy soil and why planting by the moon matters less than just loving your plants. And his life regret? That he didn't plant an oak tree as a young man. It's hard to believe Wally Richards' house plants used to drown in the dark. It's true. Manawatu's garden guru says it took him years to realise that what made most house plants unhappy was the wrong light levels. "They'd look sick, so I'd give them a drink." He has come a long way since then. He has written three books about gardening and health, his intensely practical, how-to gardening columns are syndicated throughout New Zealand, his website receives more than 1000 hits a day with gardeners asking him to diagnose and solve plant, pest and soil problems, and his phone rings dozens of times a week with people seeking gardening help. Yet, he says he's a bit of a recluse, content now at 65 to stay home with his hens, cats and dogs, communing with his plants and getting his hands in the soil. "The soil's the important thing. Feed the soil the right things, put in more than you take out, and your plants will thrive." He smiles at some gardening theories, such as that of planting with the so-called correct phase of the moon. He has tried most things in the garden, but now, with more than 60 years' spade-tip experience, he thinks other things are more important. "I think now that if you think it's the right time to plant something, you give that plant or seed positive energy to grow. It's simple – if you love your plants, they will grow well for you." His front garden, viewed through light rain from under an umbrella, proves his gardening theories. Thriving vegetable plants grow thriftily in every sort of container imaginable. There are strawberries in wood troughs hanging shoulder-height along the fence. A block of corn is shoulders-back and heading upwards in another big, square trough. Old plastic bins support carrots. Wally says he has found that containers are easier on mature knees and a heart that's inclined to angina, and he can get the soil in a container how he wants it, jam-packed with trace elements and minerals that feed plants. Soil's a living structure, packed full of microbes, enzymes, bacteria, worms and insects. Happy soil seethes with life, even if humans can't see it. "Mostly, I plant and water now. It takes about half an hour to water everything properly. "Hold the hose in one hand, and check everything for pests or diseases with the other." His grandparents started him gardening. They had the typical big Kiwi section of the time, with hens, fruit trees and a huge vegetable garden that fed the family and friends. One of young Wally's early summer tasks was to take an old tennis racket and deal to white butterflies, batting them out of the air as, with a full load of eggs, before they dive-bombed the brassicas. Any ceasefire in the aerial warfare would mean he would later have to delve in among the cabbages to pick out caterpillars that had made it. "Nobody sprayed chemicals in those days. Couldn't afford it, and we knew it wasn't healthy." "The chooks got all the snails and caterpillars and beetles, all the weeds, and we got their manure to put back in the garden." His father died young, and the Palmerston North house he and his mother moved to didn't have much garden space. Fellow members of the Trinity Methodist Church offered Wally soil at their house, and he kept both families supplied with vegetables. When he left school, he joined the former Post and Telegraph Department, as a telephone exchange technician. He worked in Palmerston North, Te Kuiti and Hamilton, and everywhere he lived he made a vegetable garden. "I had a little rotary hoe. I'd eye up a piece of lawn and work it up." His garden writing nearly didn't happen. He was a man who had left school without writing qualifications – "I didn't have School Cert English" – and writing hadn't been part of his life. "I'd come back to Palmerston North, and I had a shop in Square Edge, Nature Spirits. I grew and sold house plants." A former Tribune editor used to buy his plants, and one day asked him to write a garden column. Wally refused, but the editor was persistent, suggesting he write about house plants. "Well, I had a go, and it's worked out OK."
That was 27 years ago. His columns proved popular, and garden centres asked him to write for them. Then Manawatu Standard garden writer Nick Scott retired, and offered Wally the chance to buy his column syndication. Wally's advice then went to about 12 newspapers. "It wasn't particularly difficult to find ideas. I had four garden shops at one stage, and the columns would come from customers' questions and from what I was doing in my own garden." As time passed, Wally moved into garden products, as well as plants. This side of the business grew out of good customer service at his shops. Customers would ask him how to improve soil, or ways to garden more naturally. He now has a thriving product business selling soil improvers, such as neem tree oil and granules. His packing shed has a distinctive smell from the neem products – warm, slightly oily and not quite coffee. He says he found a niche with the products. People wanted them, but not in the bulk quantities that suppliers offered. He breaks them down into quantities that suit home gardeners and retail centres. His website, gardenews.co.nz, has been running since 1996 and helps drive his business, Garden Enterprises and Information. Lately, he has become interested in the health aspects of gardening. He has lived his life on vegetables dug fresh and still squeaking from the garden, and he has concerns about mass-produced food, heavily sprayed and grown with chemicals in a mono-cultural production environment and cool stored until it suits shops to release them. "I don't go for organic. That word has too many connotations. I just call my garden methods natural. Everything's done naturally."